10-23 enlisted and officer personnel currently serving or who have previously served as an officer in charge of a small craft. 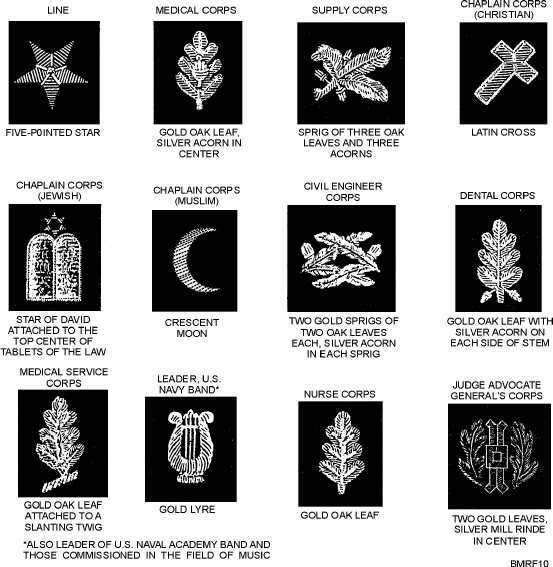 Enlisted personnel wear silver and officers wear gold when they are authorized to wear these special insignias. This insignia is worn in the same manner as the Command at Sea insignia. The Surface Warfare insignia is worn by officers and enlisted personnel who have qualified in all phases of surface warfare. The Submarine Warfare insignia is worn by personnel who have qualified to serve in submarines. In addition to the basic insignia, other submarine insignia include those for submarine medical, engineer, and supply officers and for all who participated successfully in combat patrols. The Aviation Warfare insignia is worn by personnel qualified to serve in flight. In addition to the Aviation insignia, other insignia are worn by flight officers, flight surgeons, flight nurses, aircrewmen, astronauts, and air warfare specialists. The Special Warfare insignia is worn by personnel qualified in underwater and beach reconnaissance, demolition, and special warfare tactics. They are usually associated with underwater demolition or Student Notes: Figure 10-15.Line and staff corps officers insignia.